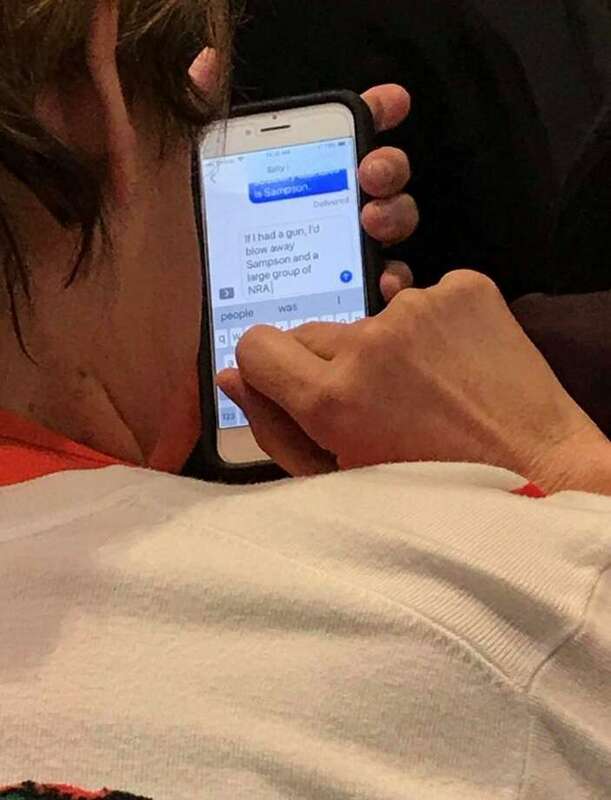 A woman was removed by Capitol Police from a public hearing on gun legislation on Monday after sending this text message at the state Capitol in Hartford. HARTFORD — A woman was removed from a public hearing on gun legislation Monday morning after writing a in a text message that she would like to shoot a state senator. A person nearby snapped a photo of the text message, which being sent to Grossman’s daughter. Sampson, a Republican from Wolcott, is an outspoken gun-rights supporter, who questioned witnesses who testified during a hearing in the State Capitol complex on safe storage of guns, ghost guns and carry permits. Sampson reported the incident to the Capitol Police after the photo of the text message was sent to him, a Capitol Police report indicates. Grossman was escorted from the hearing room and asked to leave the building for the day. “She left without incident,” said Walter Lee Jr., chief of the Capitol Police. The woman was not arrested because her behavior did not violate the state statute on threatening behavior, said Lee. Grossman, 64, did not have a criminal history or any record of gun ownership, the police report said. “Sad to say it’s not the first time I’ve been threatened in this job,” Sampson said. The Capitol Police frequently intervene during heated public hearings, said Lee. “I’ve been here twenty years and we have had multiple incidents like that,” he said. Also during the hearing, Jeremy Stein, executive director of CT Against Gun Violence, brought in a piece of a firearm, which somehow made it through a security check at the entrance of the Legislative Office Building. “I have the feeling it never should have come in,” said state Sen. Gary Winfield, D-New Haven, co-chairman of the committee. Rules on public-hearing testimony prohibit the use of props.